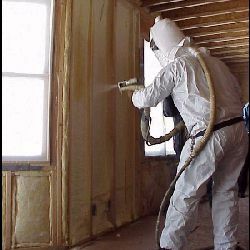 Soy Spray Foam Insulation. Soy Spray Foam Contractors. Soy insulation is made of recycled plastics and soy based oils. It is resistant to mold, mildew, insects and rodents. Unless the dreaded UFFI insulation it does not contains urea formaldehyde. It is sprayed into a regular 2"x4" stud wall where expands up to a hundred times its volume effectively filling in all cracks and voids. The R-value for Closed Cell Foam Insulation filled 2"x4" wall is approximately the same as a 2"x6" wall insulated with the regular fibreglass batt insulation. The best time to insulate with soy foam insulation is during the construction of the house. This type of insulation will greatly lower the cost of heating and cooling your home. Open Cell Soy Spray Foam Insulation is a low density insulation that expands quickly and cures within minutes. It provides a R-13 insulation value for a 2"x4" wall. (R- 3.8 per inch). Open cell insulation is a good air barrier but cannot be used as a vapour barrier. Closed Cell Soy Spray Foam Insulation is more dense than the open cell spray insulation and allows virtually no air infiltration. It also expands quickly and cures within minutes. The R-value for a 2"x4" wall is R-19 (R-5.5 per inch). Once cured it is strong enough to walk on. This type of insulation provides more strength to a structure but it also requires more material, and as a consequence, is more expensive than the open cell spray foam insulation. Closed cell insulation is also a good vapour and air barrier.